Quality Soft Tablecovering. Elegant Enough For Weddings. Vanity Fair Table Covers have been replaced by Linette Deluxe Table Covers 7 Pack. 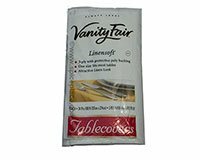 Vanity Fair Tablecovers are 3-ply soft napkin covering with poly backing to protects tables. These quality tablecoverings are elegant enough to use as a tablecloth for a wedding. Color is White. One size fits most tables. This is a bulk pack of 6 tablecloths.